This piece is now included as a duet in Under the Double Rainbow to make it more accessible to harp cirlces and ensembles. Prelude for Peace is a beautiful ensemble for 8 instruments and vocals in 3 parts. Sharon Thormahlen and Annie Thormahlen Jenkins wrote this piece together on a vacation in North Carolina. The piece can be played entirely on harps. It is a great piece to play at your harp circle. It is not a difficult. There is a full conductors score as well as each individual part. The vocals do not need to be included in the piece. It can be done all instrumentally. Hand to heart and heart to hand, Alleluia. The book is $20. 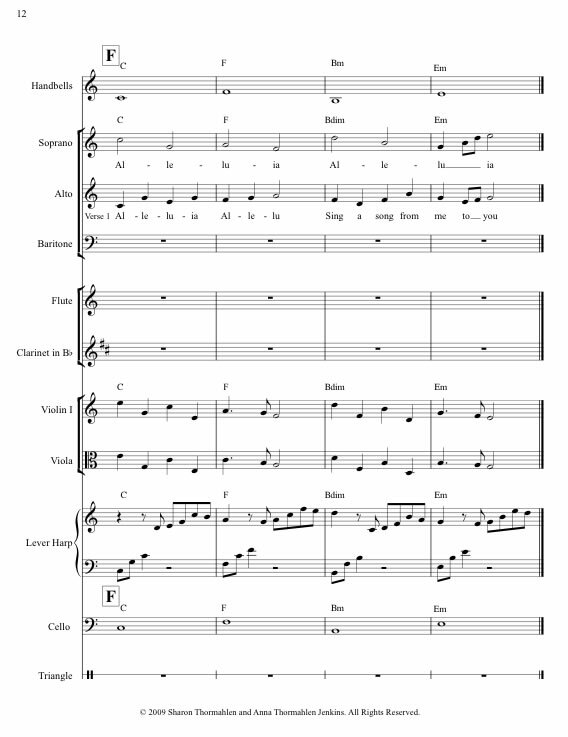 Below is an excerpt from the conductors score which is 11 pages long (starting on page 4 of the book). The book also includes each part separately so they can be distributed to each individual. The book is $20. Now available with an audio CD accompaniment ($5). I purchased you beautiful 'Prelude for Peace' to perform with a music group I belong to.We have just finished 9 concerts all over the place (all for charities) and mostly in churches.One was for amnesty international and another was for homeless and struggling youth. Your music was a smashing hit. We didn't have a cello so we used a bass clarinet and we couldn't get any handbells (something we don't use a lot in Australia) so we had to use a Glockenspiel.I hope you don't mind me making do with these other alternate instruments. From Sharon: Annie and I are thrilled with your performance.We don't mind in the least that you were creative and made it work for you and the instruments that you have. In fact we encourage that!! At the Big Sky Folk Harp festival this year (2009) about 12 of us under the conductorship of Laura Zaerr rehearsed this piece one time and performed it at the Saturday night Ceili. It was a lot of fun and proved to be a very doable and beautiful piece for a group to pull off! An update from Thom (Dec 2009): "The music [at the Wellfleet Congregational Church (in Massachusetts)] went over so amazingly well. On person told me that he usually sits through the prelude with his mind racing, but not today. With all the musicians and the beauty of the music, he was totally focused for the first time. Now it's on to the Epiphany concert with the same instrumentalists and a 50 voice choir." Here is the video. This is such a gorgeous piece but at first glance one would think that a small ensemble could just not perform it. On the contrary - The Memphis Harp Ensemble has performed it many times. The parts for other instruments can be played on the harp - or other instruments than recommended. AND there are apps for the hand bells. They used the app, “Melody Bells,” but am sure there are others. They played it in very large dining room filled with people and were surprised to learn that the iPhone could be heard without amplification. There were times the phone was plugged into an amp. The ensemble looked at and played your Prelude for Peace. They were very enthusiastic. One of our members has a daughter with Down Syndrome and for years has limitedly played the harp. She can count simple rhythms. Mom had bought her a set of bells like those used in classrooms. It isn't the best of tone - but she went home to practice and by Monday her mother tells me she has the bell part down pat. We'll be working on it some more at practice this Friday. I'll keep you posted on our progress. Thanks to you and to Anna for the lovely "Prelude for Peace." It was performed at 2nd Reformed Church in Pella, Iowa, this past Sunday (November 15, 2009). There was a wonderful hush over the congregation, and many grateful comments were received after worship. 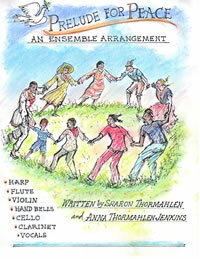 We performed it with choir, two violins, viola, clarinet, cello, handbells & triangle. All I can say is, "Wow!" We played through Prelude for Peace today and the first words I heard were, "Exquisite!" Then "beautiful" and then "wonderful" and the praises kept coming. Because of the simplicity we were able to feel the peace that our music was providing. Extraordinary! One of the husband's showed up at the end and he had to sit and listen and he agreed. Thank you for giving us peace. Beautiful piece Sharon! I like how well the calm setting prepares the congregation for worship. This seems like a piece that any size of music ministry could prepare in a short time. Well done! Your song, "Prelude for Peace" was used at my church a few months back as a lovely prelude for the new building dedication service. There were strings, brass, choir and harp involved and it was the perfect choice for all levels of ability while offering the correct mood for the service.